Berlin is the capital city of Germany and one of the 16 states of Germany. With a population of 3.5 million people, Berlin is Germany’s largest city and is the second most populous city and the seventh most populous urban area in the European Union. Located in northwest Germany, it is the center of the Berlin-Brandenburg Metropolitan Region, which has 5.9 million residents from over 190 nations. Berlin is noted for its numerous cultural institutions, many of which enjoy international reputation. The diversity and vivacity of the Zeitgeist Metropolis led to a trendsetting image among major cities. The city has a very diverse art scene and is home to around 420 art galleries. Many young people and international artists continue to settle in the city, and Berlin has established itself as a center for youth and popular culture in Europe. Berlin is home to many international and regional television and radio stations. The public broadcaster RBB has its headquarter in Berlin as well as the commercial broadcast MTV Europe, VIVA and N24. German international public broadcaster Deutsche Welle has its TV production unit in Berlin, and most national German broadcasters have a studio in the city. Berlin is an important center in the European and German film industry. It is home to more than 1000 film and television production companies, 270 movie theaters and around 300 national and international co-productions are filmed in the region every year. The historic Babelsberg Studios and the production company UFA are located outside Berlin in Potsdam. The city is also home to the European Film Academy and the German Film Academy and hosts the annual Berlin Film Festival. Berlin’s nightlife is one of the most diverse and vibrant of its kind in Europe. Throughout the 1990s, people in their twenties from many countries, particularly those in Eastern and Central Europe, made Berlin’s club scene the premier nightlife destination of Europe. Berlin is home to 153 museums. The ensemble on the Museum Island is a UNESCO World heritage site and is situated in the northern part of the Spree Island between the Spree and the Kupfergraben. As early as 1841 it was designated a “district dedicated to art and antiquities” by a royal decree. Subsequently the Altes Museum was built in the Lustgarten. The Neues Museum, which displays the bust of Queen Nefertiti, Alte Nationalgalerie, Pergamon Museum and Bode Museum were built there. Apart from the Museum Island, there are many additional museums in the city. The Gemäldegalerie focuses on the paintings of the “old masters” from the 13th to the 18th centuries while the Neue Nationalgalerie specializes in 20th-century European painting. The Deutsches Historisches Museum re-opened in the Zeughaus with an overview of German history through the fall of the Berlin Wall in 1989. The Bauhaus Archive is an architecture museum. In Lichtenberg, on the grounds of the former East German Ministry for State Security (Stasi), is the Stasi Museum. The site of Checkpoint Charlie, one of the most renowned crossing points of the Berlin Wall, is still preserved and also has a museum, a private venture which exhibits comprehensive documentation of detailed plans and strategies devised by people who tried to flee from the East. Berlin is home to more than 50 theaters. The Deutsches Theater in Mitte was built in 1849-1850 and has operated continuously since then except for a one-year break (1944-1945) due to the Second World War. The Volksbühne at Rosa Luxemburg Platz was built in 1913–14, though the company had been founded in 1890. The Berliner Ensemble, famous for performing the works of Bertolt Brecht, was established in 1949, not far from the Deutsches Theater. The Schaubühne was founded in 1962 in a building in Kreuzberg, but in 1981 moved to the building of the former Universum Cinema on Kurfürstendamm. Berlin has three major opera houses: the Deutsche Oper, the Berlin State Opera, and the Komische Oper. The Berlin State Opera on Unter den Linden opened in 1742 and is the oldest of the three. Its current musical director is Daniel Barenboim. The Komische Oper has traditionally specialized in operettas and is located at Unter den Linden as well. 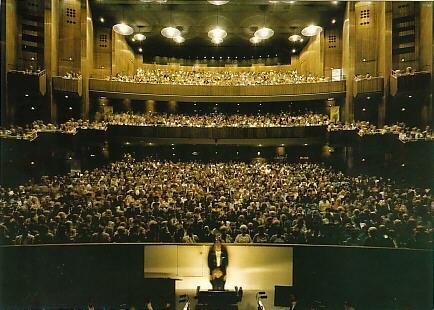 The Deutsche Oper opened in 1912 in Charlottenburg. During the division of the city from 1961 to 1989 it was the only major opera house in West Berlin. The city's main venue for musical theatre performances is the Theater des Westens (built 1895). There are seven symphony orchestras in Berlin. The Berlin Philharmonic Orchestra is one of the preeminent orchestras in the world. It is housed in the Berliner Philharmonie near Potsdamer Platz on a street named for the orchestra's longest-serving conductor, Herbert von Karajan. The current principal conductor is Simon Rattle. The Konzerthausorchester Berlin was founded in 1952 as the orchestra for East Berlin, since the Philharmonic was based in West Berlin. Its current principal conductor is Lothar Zagrosek. The Haus der Kulturen der Welt presents various exhibitions dealing with intercultural issues and stages world music and conferences. The Zoologischer Garten Berlin, the older of two zoos in the city, was founded in 1844, and presents the most diverse range of species in the world. It was the home of the captive born celebrity polar bear Knut, born in December 2006. The city’s other zoo is Tierpark Friedrichsfelde, founded in 1955 on the grounds of Schloss Friedrichsfelde in the Borough of Lichtenberg. Berlins Botanisher Garten includes the Botanic Museum Berlin. With an area of 43 hectares and around 22.000 different plant species it is one of the largest and most diverse gardens in the world. The organizing factor of Berlin’s cuisine is meat in every form. Smoked, roasted, boiled or marinated pork knuckles, the suckling lambs and wild boars rule the culinary stage of the capital. Though influenced by various ethnic traditions, the Berliner culinary canon remains quite stable. Eisbein, literally meaning ice leg is the world famous Berliner take on cured knuckle of pork. In its most traditional form, it’s a heavily marbled piece of pork knuckle covered with a crispy layer of fat. The meat takes hours to be braised, but as a result it’s very tender and aromatic. The knuckle is always served with a hearty portion of sauerkraut, mashed peas and boiled or roasted potatoes or potato dumplings. According to local legend, the dish was first prepared around 100 years ago in a small restaurant named Görlitzer Bahnhof. Berliner Potato Soup is a smooth cream of potatoes mixed with carrots, as well as a variety of herbs and parsley that give it its characteristic flavor. Chunks of cured meat and various kinds of sausage are also added to the soup. It’s best served with a topping of bits of roast onion and accompanied by several slices of fresh rye bread. The Berliner version of potato soup was a special favorite of Kaiser Wilhelm. Donner Kebab. Foreigners sometimes joke that Berliners seem to think that Doner Kebab is their national specialty. Well, it’s actually true. It was the Turkish immigrants inhabiting Berlin’s district of Kreuzberg that invented the dish in 1971. The original recipe for a Turkish specialty was simplified and adjusted to western European tastes. Its popularity steadily rose throughout the 70s and 80s, and today it’s one of Europe’s most popular fast food dishes. Usually, it’s a mixture of lamb, beef or chicken strips, various vegetables and sauce served in a Turkish pita. A variety using a durum pancake instead of a pita is also quite popular though a bit more expensive. Berliner Pfannkuchen, in its classic form, consists of fried sweet yeast dough filled with marmalade or jam and iced with powder or conventional sugar. Recently developed versions of the treat feature such fillings as chocolate, mocha or champagne. Regardless of the type, the filling is added to the doughnut after the baking process by means of a large syringe. In 2009, the nominal GDP of the city-state Berlin experienced a growth rate of 1.7% and totaled 90.1 billion Euros. Berlin’s economy is dominated by the service sector, with around 80% of all companies doing business in services. Fast-growing economic sectors in Berlin include communications, life sciences and transportation, particularly services that use information and communication technologies, as well as media and music, advertising and design, biotechnology, environmental services, and medical engineering. The Science and Business Park of Berlin-Adlershof is among the 15 largest technology parks worldwide. Research and development have high economic significance for the city, and the Berlin-Brandenburg region ranks among the top-three innovative regions in the EU. Siemens a Fortune Global 500 company and one of the 30 German DAX companies is headquartered in Berlin. The state-owned railway, Deutsche Bahn, has its headquarters in Berlin as well. Many German and international companies have business or services centers in the city. Among the 20 largest employers in Berlin, are the Deutsche Bahn, the hospital provider Charite, the local public transport provider BVG, and the service provider Dussmann and the Piepenbrock Group. Daimler manufactures cars and BMW builds motorcycles in Berlin. advertising, architecture, art design, fashion, performing arts, publishing, TV, radio and video games. Around 22.600 creative enterprises, predominantly SME’s, generated over 18.6 billion Euros in total revenue. Berlin’s creative industries have contributed and estimated 20% of Berlins GDP. The vibrant German capital offers a lot of entertainment as well as cultural delights. You can see most of the capital from a boat trip on the Spree River. Tours usually go around Museum Island, past the government buildings and reveal the most picturesque parts of the city.